Charles was born on 29 Jul 1795 in Gorleston, Suffolk, to Charles Clarke (1767–1835), a shipmaster, and Anne Knights, daughter of John Knights of Burgh Castle, Suffolk. After attending Fauconberge School, Ballygate Street, Beccles, Charles entered Caius College, Cambridge in November 1813. There he read divinity and mathematics, reaching the level of 7th. wrangler. He graduated in 1820. In 1822 Charles Clarke was ordained as a priest in the Church of England. In 1824 he was appointed Stipendiary Curate for the Parish of Mutford in Suffolk. He ministered at the church of St. Mary in Henstead for the remainder of his life. Between 1833 and 1853 he served as a Justice of the Peace in the Beccles Division. It would seem as if a man with his talent for mathematics, was rather thrown away in a country parsonage! However, he probably led the sort of life he wanted, which is more than most people can say in these more strenuous days! Charles's mathematical skills were not left completely unused. He formed a close association with the astronomer James South with whose computations Charles gave assistance. Charles's second son was named after this astronomer, and use of the forename 'South' continued into the 20th century. In 1834 he testified in a Parliamentary Report on the operation of the Poor Laws in his own and adjoining parishes. His text concentrates on the statistical evidence and numerical data relating to income distribution. Charles was married on 21 Sep 1820 in Cringleford, Norfolk, to Anne Browne, the daughter of Alexander Browne of Hassingham in Norfolk. 25th February, 1980. Daphne Clarke. Planted 102 ranunculus which Mr. Banham sent me, according to his directions. John1 went to Beccles for the trees from Mackay's this morning but could not plant them as the wind was too high. The standards very good plants: did not like the dwarfs so much. Planted nineteen cherry trees myself in the garden this day - 10 Caroons; 4 May Dukes; 4 Black Hearts; and 1 White Heart. Planted some gooseberry and currant bushes. 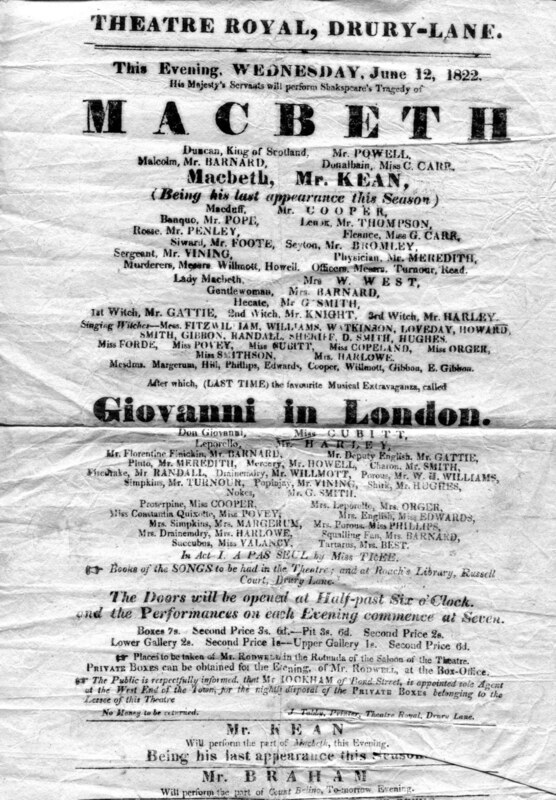 A flyer for Shakespeare's play Macbeth. The cast was led by Edmund Kean. Charles Clarke most likely attended the performance. The following year he planted his hundred and two ranunculus, of which, in 1792, there were reputed to be upwards of eight hundred kinds, and which were grown to an enormous extent by the old Florists, whose societies antedated our modern horticultural societies and provided the latter with a great deal of useful experience. A colony of Flemish weavers held a florists' feast in Norwich in 1637, and it is probable that from there the love of flowers spread to other manufacturing centres all over the country. The artisan florists were dedicated, industrious men administering their societies with ability and proficiency. They studied the cultivation and propagation of their chosen flower in great detail, and set out rigid rules of size, colour, configuration and pattern by which it should be judged. Some of these rules were very arbitrary, and any plants that did not conform to them were discarded, although many of these rejects would be regarded as beautiful nowadays. However, they set standards and gained experience of organisation for which the Royal Horticultural Society must have been grateful when it was founded in 1804. The attention to flowers which is so conspicuous there, is in a particular degree an effort of the peculiar manufacturing habits of the people. It is well known that, not only for the execution of the most delicate ornamental muslins, but for the invention of patterns, the operative manufacturers of Paisley stand unrivalled. Their ingenuity is continually in exertion for new and pleasing elegancies to diversify their fabrics. Now, where such habits obtain, the rearing of beautiful flowers, which is an object very congenial to them, will easily be adapted, and pursued as a favourite amusement. On the other hand, it seems highly probable that the rearing of flowers, by a reaction, must tend to improve the genius for invention in elegant fancy muslins. The florists of Paisley have long been noted for the peacefulness of their dispositions, and the sobriety of their manners. The Florists' Club not only represses all irregularities at its weekly meetings, which dismiss at ten in the evening; but it would erase from its lists any disreputable name. It is pleasing to think, that not only the attachment of individuals to the culture of beautiful flowers, but the association of persons possessing this taste, seems to be favourable to social order. Dean Hole, another cleric, whose experience of them prompted him to form the National Rose Society, often judged the exhibits at the shows held by the Florists' Societies. I have always believed that the happiness of mankind may be increased by encouraging that love of a garden, that love of the beautiful, which is innate in us all. Get a man out of the dram and beer shops into the fresh pure air, ... give him an occupation which will add to his health and the comforts of his family, instead of destroying both, then build Revealed upon Natural Religion, and hope to see him a Christian. Set out my pipings of pinks and carnations in the little garden; and bought three layers of carnations at Mr. Penn's, at 4d. each. Pinks were supreme favourites in the manufacturing districts and had an intense attraction for the working people. In 1767, only twelve sorts are listed, but in the early years of the nineteenth century Pinks were cultivated everywhere, and the Paisley Floral Society could show 70 or 80 of the most choice varieties at their shows. There was great rivalry and keen competition between the artisan growers of London, Manchester and Paisley. Planted the strawberries at the upper end of the garden - 3 rows of Hautboys. This variety can no longer be found in catalogues: although it is defined in a modern dictionary as a large kind of strawberry. And it may be recalled that Hautboy was the variety discussed by the strawberry-picking party delineated with such enviable economy by Jane Austen in "Emma," published two years prior to this entry in the diary. The best fruit in England - everybody's favourite - always wholesome. These the finest beds and finest sorts. Delightful to gather for oneself - the only way of really enjoying them. Morning decidedly the best time - never tired - every sort good hautboy infinitely superior no comparison - the others hardly eatable - hautboys very scarce - Chili preferred white wood finest flavour of all - price of strawberries in London - abundance about Bristol Maple Grove - cultivation - beds when to be renewed - gardeners thinking exactly different no general rule - gardeners never to be put out of their way - delicious fruit - only too rich to be eaten much of - inferior to cherries - currants more refreshing - only objection to gathering strawberries the stooping glaring sun - tired to death - could bear it no longer must go and sit in the shade. Read a novel called 'Sense and Sensibility' - not worth reading. An opinion shared, alas, by both his Great-Grandson and his Great-Great Grandson. In any case, he was far too busy sowing his dahlias (another Florists' favourite); Scotch Fir seeds; French apple pips; and numerous vegetables, such as cauliflowers, Swedes, Scarlet runners, kidney beans, lettuces, cucumbers, radishes, mustard and cress. It is like the Tulip, Pink, etc., a poor man's flower, and a fine blow is rarely seen in the gardens of the nobility and gentry. Nevertheless, Repton must surely have been gratified to have at his disposal such a comprehensive and distinguished choice of plants with which to restore to the hitherto unadorned parks, gardens and London squares the flowers and shrubs which the professional and working classes had done so much to foster and improve. The Diaries of Charles Clarke. 1816-1818. British Garden Flowers, by George M. Taylor. 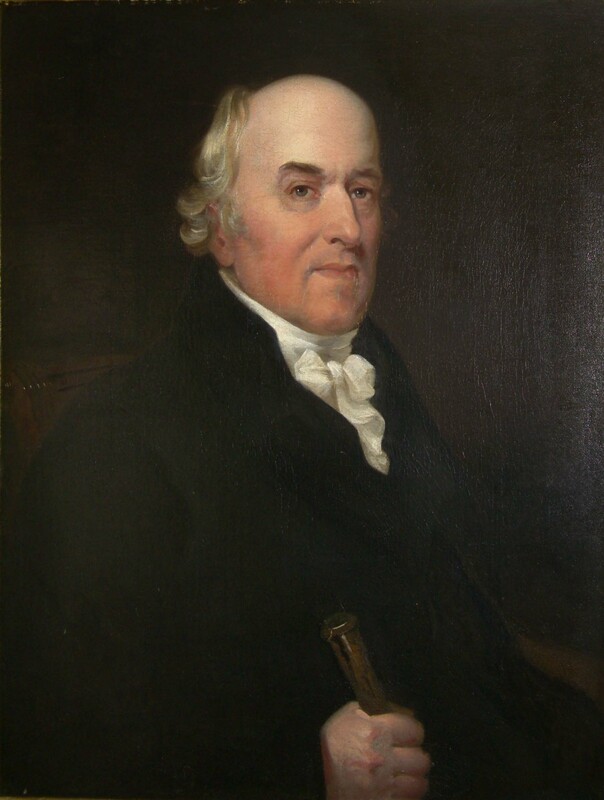 Humphry Repton, by Kay N. Sanecki. 1) Possibly John Botwright, born at Hulver 1796, and, while still living there in 1841, stated his profession as 'gardener'. Last modified: 2013 August 31st.